The latest addition is called the Blossoming Ancient. This pet is currently listed on the PTR as a Pet Store companion, Bind on Pick Up and not cageable. While we've seen Ancients before throughout Azeroth, this companion version has a very unique feature. 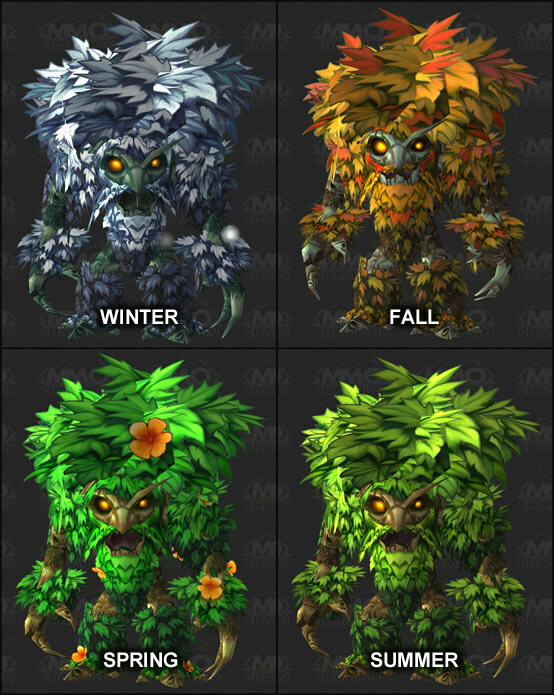 Depending on the season, the Blossoming Ancient will change color! Whether winter, fall, summer or spring, it has the appropriate foliage for all seasons! Now if only we could decorate it for Winter Veil! Traveling from Tamer to Tamer may have an extra perk in 5.3. A new achievement called The Longest Day was datamined in the latest PTR build. So far the only criteria of the achievement is to complete three Tamer dailies. The dailies are low level, but keep in mind that this may be updated in the future. After completing this achievement, you will receive a new type of battle-stone, the Marked Flawless Battle-Stone (not to be confused with the tradeable, generic Flawless Battle-Stone). The new stone is BoA but can be applied to any pet family-type. Pets have had the base 5% chance to dodge removed, and the chance to miss a higher level pet has been reduced from 5% to 2% per level. Because of the removal of the base dodge chance, some abilities with 100% chance to hit needed to be retuned to keep them balanced. These attacks have had their damage increased by 5-15% but their chance to hit reduced by 5-15%. Check out the article for a full list of abilities that will be affected by this change.